Want to learn some handy Italian travel phrases to buy food? And, just as importantly, you’ll be able to understand the kind of phrases shop assistants will say back to you. 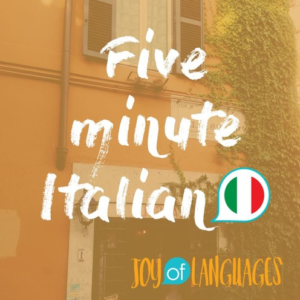 With each lesson, you’ll find a transcript, so you can read the Italian dialogue followed by a mini grammar and vocabulary tutorial. How can I remember Italian words and phrases? One of the hardest parts about learning a language is remembering all that vocabulary! To make new words and phrases stick, it’s important to review them regularly. Quiz yourself on the new Italian words and phrases. Keep reviewing what you learnt, so you don’t forget it. You’ll find a link to download these flashcards at the end of each lesson, with instructions on how to use them. Ready to learn how to speak Italian in shops and supermarkets? Matteo: And I’m Matteo. Ciao. K: And in today’s lesson, we’re going to learn how to find our way around an Italian supermarket. We’re going to start with a little dialogue in Italian. Listen and see how much you can make out, then we’ll talk you through the details after. Imagine you’re in the supermarket, but you don’t know where anything is. So you go up to the poor shop assistant, il commesso, and you start asking loads of questions. Katie: Mi scusi, dove sono i carrelli? Katie: OK grazie. E… dove sono le banane? Matteo: Lì, con la frutta. Katie: Perfetto. E…Dov’è la pasta? Matteo: è di la signora. Matteo: Corridoio cinque, vicino al pane. K: Mi scusi, is the formal way of saying “excuse me” with people who you don’t know very well, like shop assistants. You can also use it to say sorry, for example if you get in someone’s way, you can say mi scusi or just scusi. Just a quick reminder that you you can find the main vocabulary from today in the show notes below. M: Then you heard: dove sono i carrelli which means “where are the trolleys”. M: Dove sono i carrelli. K: Then you heard sono lì, all’entrata. M: Which means “they’re there, at the entrance”. Sono lì, all’entrata. K: We know that sono means “are”. Italians often omit the word for they. So instead of saying “they are there”, they just say “are there”. Lì means there. So you can imagine him pointing and saying “there” – lì. M: Sono lì. You might also hear the word là, which means the same thing. To say “there” you can either say lì or là. They’re interchangeable. K: And this all is interesting – a means “at” and la means “the” for feminine words, like entrata. In Italian, a and la combine together to give us alla. So to say “at the” for feminine words, you’d get alla. M: but when alla comes before a word which starts with a vowel, we remove the last a sound. So you get all’entrata. M: dove sono le banane? M: Lì, con la frutta. K: We know that lì means “there”. Con means “with”. And la frutta means the fruit. M: Then Katie said: perfetto which of course means “perfect. You should say it with a nice Italian accent: perfetto! K: Then I asked dov’è la pasta which means “where’s the pasta”. K: Di là is quite similar to là which means there. Maybe the only difference is that lì or là gives more of an impression of a specific place, so maybe you’re pointing to a specific point while you’re saying it, while di là is more of a general direction. Over there: di là. M: And then I called you Signora, which is the word you use for women. K: It’s like saying “maam” or “madam”, and Italians use it frequently. And I’m very sad about this because in the last few years people have stopped calling me signorina, which is used with girls and young women, and started calling me signora. M: Then you heard grazie, quale corridoio?. K: Quale, means “which” and corridoio means aisle. And this word is nice and easy to remember because it sounds like corridor – so you can imagine the aisle as being a bit like a corridor. M: Corridoio cinque, vicino al pane. K: Corridoio cinque of course means corridor 5. Then you heard vicino al pane, which means “close to the bread”. M: Vicino means close and il pane means “the bread”. M: a + il combine together to make al. K: So how do you say close to the bread? K + M: alla prossima! 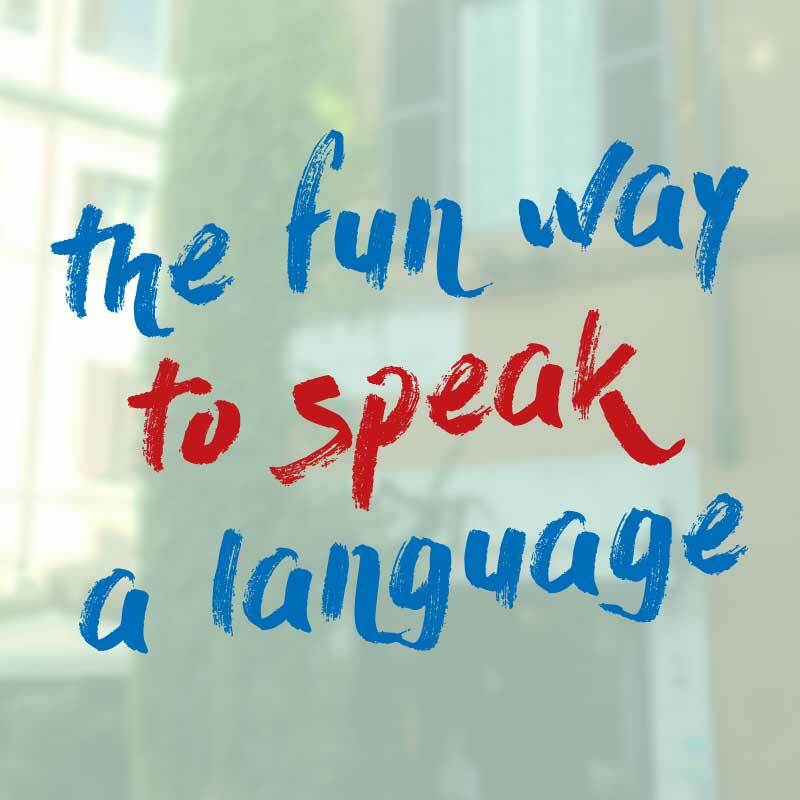 Quiz yourself on the Italian travel phrases you learnt in this lesson with our digital flashcards. Click here to download the vocabulary flashcards: how to ask for things in the supermarket. Not sure how it works? Watch this tutorial. K: If you go to Italy, something I would highly recommend doing is going to check out the deli counters, in supermarkets or in little shops because they have lots of delicious meats, cheeses and salads. It’s also a great way to start to learn about different types of Italian food that you might see on menus. K: Allora prendo due etti di burrata. K: Mi dica literally means “tell me”. But when Italians use it in these kinds of situations, it’s translation is similar to “what can I do for you?”. M: You might also hear prego in this situation, which means more or less the same thing. K: Yes, one of the many meanings of prego! M: Then, you heard Katie say: un etto di prosciutto. K: un etto means 100 grams, which is around 6 or 7 thin slices. M: you can also say cento grammi, which of course means 100 grams. K: And this question is about the types of ham. Prosciutto crudo is what we in England would call prosciutto, or parma ham. Crudo means “raw”, and it’s called that because prosciutto crudo isn’t cooked – it’s air dried and salted. Cotto means “cooked”, so prosciutto cotto is similar to the normal ham you find in England and elsewhere. 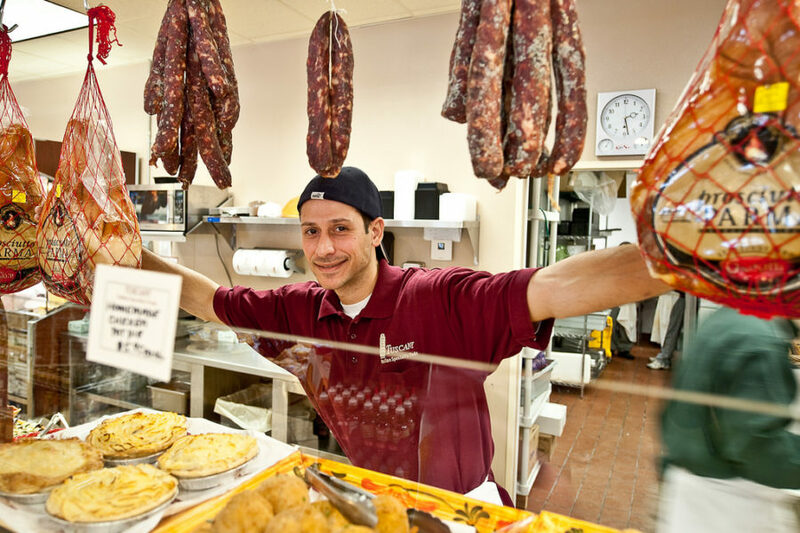 M: The names of some other common Italian meats are bresaola which is salted Italian beef, and salame, which of course means salami. M: Next, you heard Katie say crudo, grazie. And this is another example of where Italians sometimes use the word grazie, where in english you would normally say please. K: This means “what’s that?” And it’s a great way to get deeper into conversations with Italians and learn more about the culture and the language. I think I spend my first few months in Italy just pointing and things and saying: che cos’è quello? M: Then you heard: è la burrata. K: Which means “it’s burrata”, which is one of my favourite Italian cheeses. Finally something for the vegetarians! M: Burrata looks a bit like mozzarella, in fact, it’s exactly the same as mozzarella on the outside, but when you cut into it, it’s soft and creamy on the inside. K: Other examples of nice Italian cheeses are Parmigiano, which means parmesan of course, then Fontina, a soft aged cheese from Aosta Valley in the north, and Pecorino, which literally means “little sheep” – it’s a hard, salty cheese made from sheep’s milk. M: And don’t forget Mozzarella di bufala, which means buffalo mozzarella, the famous cheese of Naples. K: Allora is one of those very famous Italian words you hear everywhere. It means “so”, or “well”. K: Prendo literally means “I take”, but Italians use it to say “I’ll have”, when they’re ordering. Then you heard the plural version of etto. Before we heard the singular version: un etto, with an o at the end. The plural of etto is etti. So you get un etto, but due etti, tre etti and so on. M: Finally, you heard: basta cosi? K: Let’s listen to the conversation again. Che cos’è quello What’s that? Click here to download the vocabulary flashcards: how to order things at the deli counter. Not sure how it works? Watch the tutorial here. K: In the last couple of lessons, we’ve been learning how to order things in shops and supermarkets. This week, we’re going to continue this theme by learning how to pay for things at the till. So let’s practice a typical conversation at the till in Italy. K: Si, due grazie… quant’è? M: Sono venti e cinquanta. K: Posso pagare con la carta? M: Certo. Carta o bancomat? Katie: We started with buongiorno, which is better than ciao in situations like this where you don’t know the person you’re talking to. Matteo: then you heard: Sacchetti? K: Which literally means “bags?” and it’s like asking “would you like a bag?” Shop assistants don’t give bags automatically, they normally ask. M: Then you heard: Si, due grazie. K: Yes, two thank you. Remember with polite replies to questions, Italians don’t say please, they say thank you. Si, grazie. M: To ask for a bag, you can say: posso avere un sacchetto? K: Here we meet again the very useful phrase posso avere which means “can I have”. K: With an i at the end. And you can have tre sacchetti, quattro sacchetti and so on. M: But the word can change depending on the region. In the south of Italy, we usually say busta. M: Then you heard: quant’è? K: Which means “how much is it?” Quanto means “how much” and è means it is. And Italians smush the words together, so you get: Quant’è? M: You can also say: Quanto costa? K: Viene means “come”. So quanto viene literally means “how much come?” It’s a bit like asking “how much does it come to? M: Next, you heard: Sono venti e cinquanta. K: Can you guess how much that means? Venti e cinquanta literally means “twenty and fifty”. “20 euros 50”. Italians use the word “and” e between the euro and the cents. To introduce the price, they start with the word sono which literally means “they are”. They are twenty and fifty. M: Posso pagare con la carta? K: Literally: “Can I pay with the card”, which of course means “can I pay by credit card”. Posso means “can I”, pagare means “pay” and la carta means “the card”. Italians use the word la (the) much more than in English. K: Which is a bit of a weird one. Bancomat means debit card. And for some reason in Italy, at the till, they need to know if you’re paying with credit or debit card. Bancomat actually has 2 meanings, it also means cash machine, which is handy to know if you need to get cash out in Italy. M: Let’s listen to the conversation again. M: Sono venticinque e cinquanta. Quant’è? How much is it? Quanto viene? How much does it come to? Carta o bancomat? Credit card or debit card? Click here to download the vocabulary flashcards: how to order things at the till. Lifetime membership to the Facebook group, where you can practise with Italian teachers. Invites to online speaking workshops.